Hope you guys had a wonderful diwali celebration, mine went as usual with simple festive foods and my mom's sweets and savouries. An another usual day for us, by the way i watched all the diwali special programmes and planning to watch out a diwali movie this weekend,again this weekend is going to be our diwali party with friends and relatives.Am happy to share that i won third prize with 1000rs as prize money hosted at Asiya akka's Feast of Sacrifice Event. Thanks Akka,its a diwali gift for me. Coming to this easy pepper chicken, i prepared this dish for an event which happened in FB for lil gal who have so many allergies towards the foods, she dont eat loads of foods coz of her allergy and her mom dont know how to cook for her with the limited foods she can have easily. Her aunt asked to us to make out some dishes with a list of ingredients she can eat without any problem. 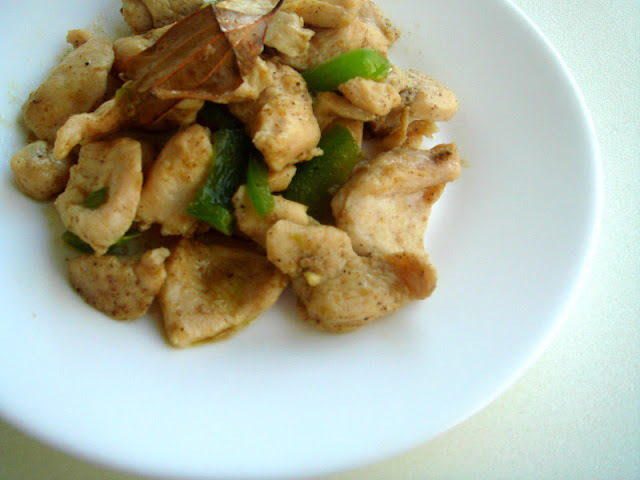 I choosed chicken and prepared this quick and very easy pepper chicken for the lil darling. This dish hardly needs less time to cook, you dont even need to chop onions. With a bowl of rice,this simple pepper chicken tastes awesome.Sending to 60days of Christmas hosted by Priya and Divya. Heat the olive oil, fry the bayleaf, cinnamon stick and cloves, add immediately the ginger garlic paste until the raw smell goes off. Add immediately the chicken pieces, sliced bellpeppers and saute for few minutes, finally add the pepper powder, salt and cook in simmer until the chicken pieces gets well cooked with the spices. The simplest of recipes taste the best. Luved ur recipe. congrats priya.. simple yet delicious..
Super simple and yum chicken recipe :) Congrats on winning :) Wish you many many more!! Hi Priya, Happy Diwali to you and family, hope you have a great time. Your chicken dish look delicious. Very quickie dish but full of flavor, love the cinnamon combo. So simple yet tasty pepper chicken! Congratulation Priya on your win! Your pepper chicken is simple, yet delicious with the perfect spices...all I would add is some nice Jasmine rice to go with it! After seeing all the sweets in fb and other blogs , i am happy to see something spicy, chicken looks so good. Some times I prefer this simplest way for my daughter, I love ur version n congrats on winning!!! Congrats Priya,on winning the prize..
And this recipe looks a real quick fix.Thanks. Congrats on the award, Priya. :)Simple and delicious chicken.. I might try this for my kids too.. she is a big fan of chicken..
Congratulations Priya on your win!